The St. Louis Blues head home after their longest road-trip of the 2015-16 season and while they fell 3-0 to the Montreal Canadiens last night I think most fans are pretty happy with the 4-2 trip and 5-2 overall record despite the injury bug already taking a big bite out of their lineup. Opening night saw some surprises on the roster but those injuries are already testing team depth. I like the look of this year’s Blues and though it’s early here are three concerns I have moving forward. Can Rookies Keep the Pace? Three rookies made the Blues roster out of training camp this year and all have made an impact through the first seven games. Forward Robby Fabbri scored a goal in his first NHL game but was unfortunately lost to a concussion after a check along the boards the following game in Minnesota. He’s listed as “out indefinitely” and didn’t travel with the Blues on the road-trip. A bittersweet beginning to the young man’s career but he obviously impressed the organization enough to earn at least the 9-game tryout. Will the uncertainty of his injury allow him to make the most of it? Defenseman Colton Parayko has played up to the pre-season hype surrounding his imposing 6′ 5″ frame and then some. He’s displayed hockey sense and vision well beyond a youngster making his NHL debut and has already netted his first multi-goal game with 2 tallies in the Blues road victory in Calgary. He’s contributed on the power play and made a gorgeous defensive play Sunday that eventually led to a St. Louis goal in the team’s win over Winnipeg. Fellow blue liner Joel Edmundson also started the season with the Blues. He’s been very solid defensively, looks calm under pressure and has shown that he’s happy to mix things up a bit as well. Though he leads the team in penalty minutes (11) he’s not making the typical rookie mistakes you might otherwise see from a first year guy and will continue to provide another physical presence on the St. Louis back end. What remains to be seen is if these young kids can handle the pressure, mentally and physically, of an 82-game NHL season. 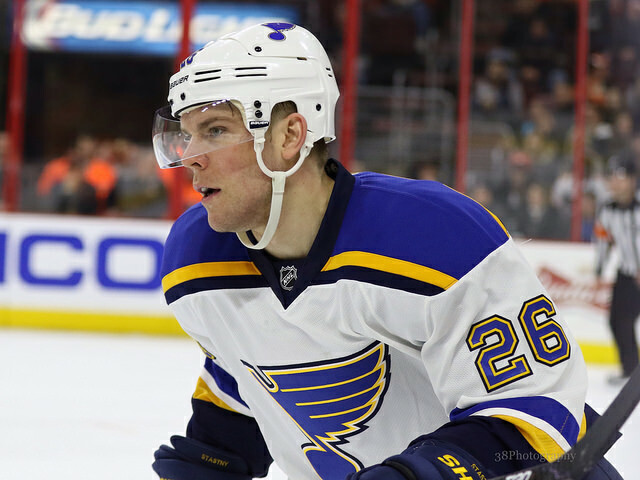 Losing Fabbri so quickly was a blow to the Blues but they’re also playing now without top centerman Paul Stastny who suffered a lower-body injury after blocking a shot during their win in Vancouver. 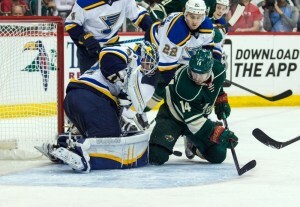 Stastny returned home to St. Louis the next day which doesn’t bode well for his return timeline. He was playing great hockey having posted a goal and 4 helpers in the first five games playing between Alexander Steen and Vladimir Tarasenko. His absence has seen the return of the “STL” line with Jori Lehtera taking his place between the two snipers, but the results haven’t been immediately positive in the box score. Kevin Shattenkirk also suffered an early injury and while he’s been skating now for a few days is still listed as “day-to-day.” Shatty remained with the team on their trip through Canada. The Blues called up Chris Butler to fill the roster spot but he’s yet to see any action, watching from the press box. The early emergence of their two rookie defensemen has helped ease the pain of losing Shattenkirk. 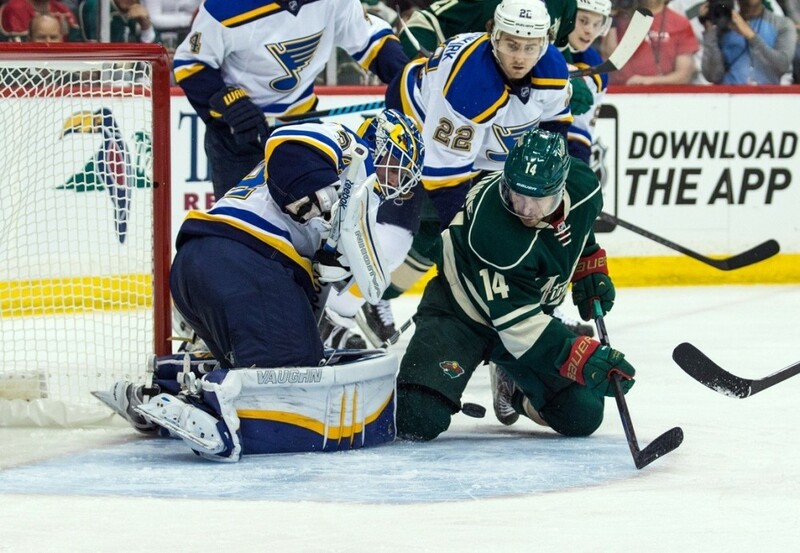 Additionally, veterans like Jay Bouwmeester and Carl Gunnarsson have stepped up their play to keep the team from slipping both at full strength and on the penalty kill. Will the Real Jake Allen Please Stand Up? Coach Ken Hitchcock said prior to Opening Night that the Blues wouldn’t pin the “starting” tag on either of their goalies until the end of October but the competition hasn’t exactly heated up since opening night. Brian Elliott arguably outplayed Jake Allen throughout camp and pre-season and has been red-hot, starting off 4-0 with a 2.01GAA thus far. Elliott looks dialed in and appears to be hungry for the starting job. In stark contrast, Allen has been shaky in his three starts and looked especially uncomfortable last night in Montreal. His angles aren’t as good as we know they can be and he was too deep in his net at times. Allen doesn’t look like the goaltender we saw last season before Coach Hitchcock tapped him as the starter for the playoffs and he isn’t playing like a guy who really wants to take control of his own fate. I’ve no doubt he’s fired up to play, but when you compare the two goalies Elliott is far and away the better choice right now to lead the Blues. The Blues have done a lot right over their first 7 games and off-season moves have played out in their favor so far. The additions of free agents Scottie Upshall and Scott Gomez and the trade for Troy Brouwer have lessened the impact of a long-term injury to Patrik Berglund and given Hitch a plethora of options when lining up his troops. It’s too early in the season to know the answers to many questions. All we can say for sure right now is that the Blues are back in action at home this weekend and the schedule doesn’t get any easier.